Others see their physical facet as the most vital aspect of the body. But if you are going to look into it, the mental health is a fundamental aspect as well. Everything is processed in the brain. Every movement that you make and every emotion that you feel is circulated through the brain before it gives out signals on how the body will react to certain stimuli. This also means that taking care of your mental health relies on the physical aspect since it is the one that you can control. Aside from maintaining a proper and healthy diet, you should accompany it with regular exercise. So what are the effects of exercise on mental health? Proper exercise maintains the body’s blood circulation. This also means that when your blood is circulating throughout your body properly, enough oxygen is given to the brain. Lack of oxygen in the brain can lead to drowsiness or even more complicated illnesses. In order to avoid this, take a few minutes every day to do some exercise. Think with Clarity Whether you like it or not, you acquire stress from your daily routine. You may not be able to control the people and situations that contribute to this but you can take necessary actions to reduce or eliminate stress in your system completely. With a few minutes of exercise each day, you can release these negative emotions and thoughts that are bothering you. So before starting your day, unload your tensions by doing some workout. You will find yourself thinking clearly for the entire day. Positive Emotions The brain is the sole source of your emotions. Don’t always blame your hormones or the people around you for behaving the way you do. If you are irritable or overly sensitive, you might be lacking some exercise. 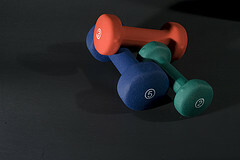 Working out allows the body to release hormones that affect the mood. So even if you are all sweaty and tired after exercising, you will still feel satisfied and light throughout the day. Increased Focus If you find yourself having a difficult time concentrating on your activities, better allot a time for your exercise. Since it results in proper blood circulation, every part of the brain receives the right amount of oxygen it needs to function well. You will be attentive and you can comprehend faster if you do. Instead of feeling sleepy and distracted, you can focus more on the job at hand. Though the human body has different systems that correspond to its function, it all works in relation to one another. That is why every time a body part is not functioning well, the rest of the body is still affected. Being healthy is not only measured physically, but health also includes the emotional and mental makeup of the person. In order to stay fit and avoid certain diseases, one must take the necessary steps to help boost their immune system. With enough conviction and effort on your part, you can enjoy the effects of exercise on mental health. Danny Duric is a fitness instructor, part-time blogger. He likes to research and updates his knowledge about health and fitness. Currently writing for E-Cigarettes R Us Australia an electronic cigarette supplier from Australia. A longtime housewife with a passion for reading, writing, cooking and exercising. Crossfit vs Bodybuilding vs Cardio – Which Program Is Right For You?